Happy hump day everyone! I had to go through quite a bit of trouble to get this post published today. After finally finishing my semester at school, I thought I could devote my time to blogging, but first, my very old copy of Photoshop (what I use to edit my photos) finally crashed for good and refused to open any files; then, I had trouble signing into my blog for the last 2 days. These all seem to be normal issues that regular bloggers experience from time to time. I’m glad I got my first troubled experiences out of the way and even happier that today I got everything sorted out! 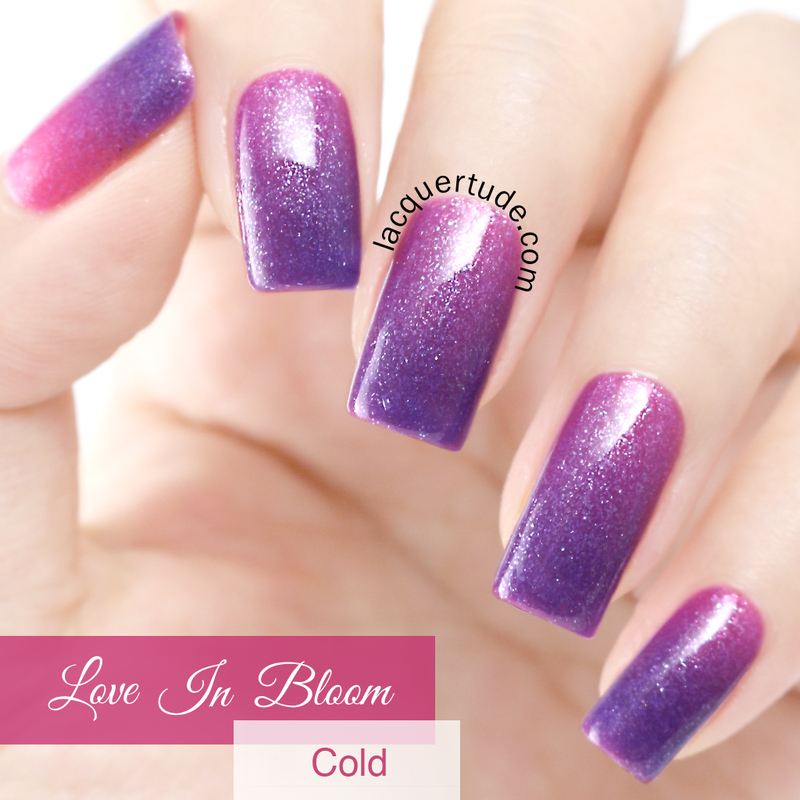 I’m excited to show you my review and swatch of Polished by KPT’s March Into Spring Collection, consisting of 5 gorgeous thermals inspired by the spring season. Katherine, the creative genius and owner behind this indie line, is well-known for her beautiful and high quality thermal polishes. Well, this collection is just as amazing and I’d be hard pressed to pick a favorite! 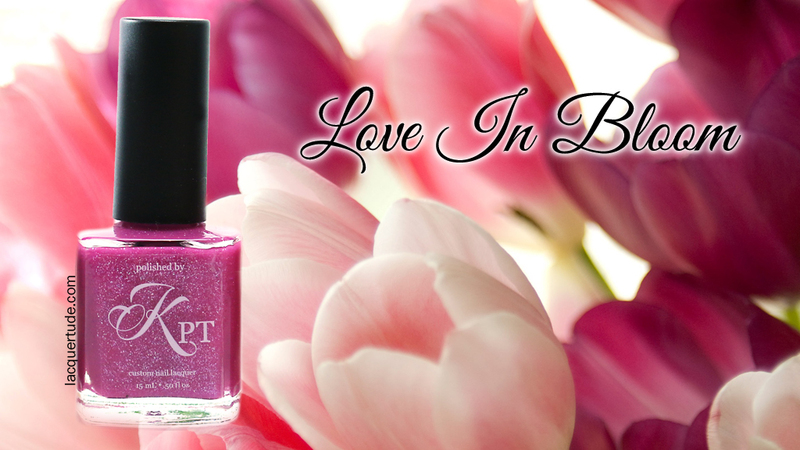 In terms of formula, all polishes in the collection had even and smooth application. I applied 3 coats for each because each coat dried quite quickly and I really loved the depth created by the flakes. Love In Bloom reminds of me of all the blooming vibrant tulips that I see everywhere I go, on pristinely landscaped lawns, in the neighborhood parks, and even found decorating the entrances of grocery stores. If I REALLY had to pick just one, this would be my favorite of the collection. When warm, this thermal is a beautiful pink filled with micro green and purple flakes. 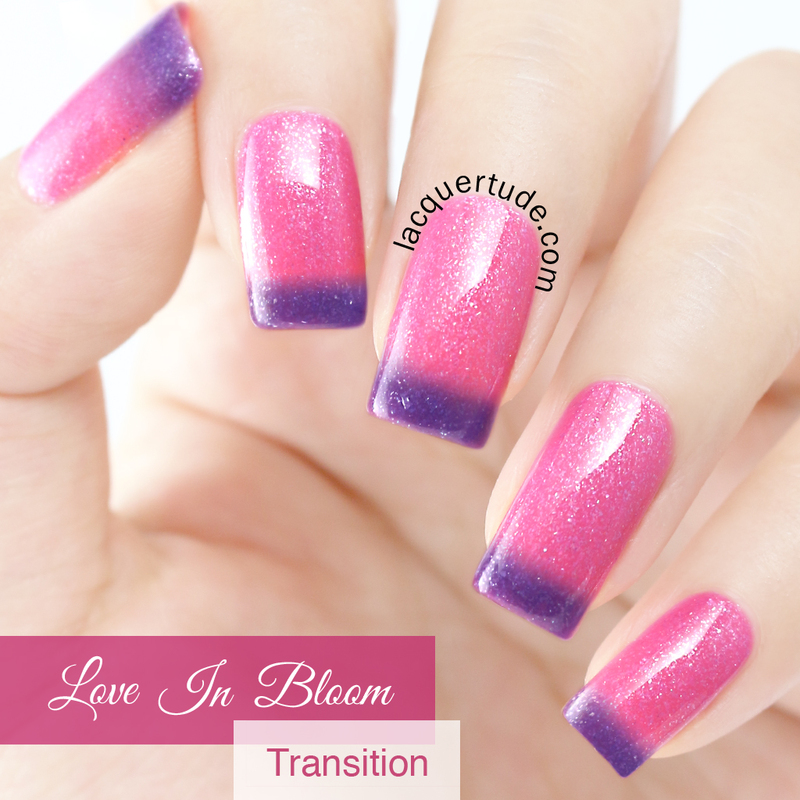 During transition, you can see the gorgeous purple tips that pairs perfectly with the bright pink. 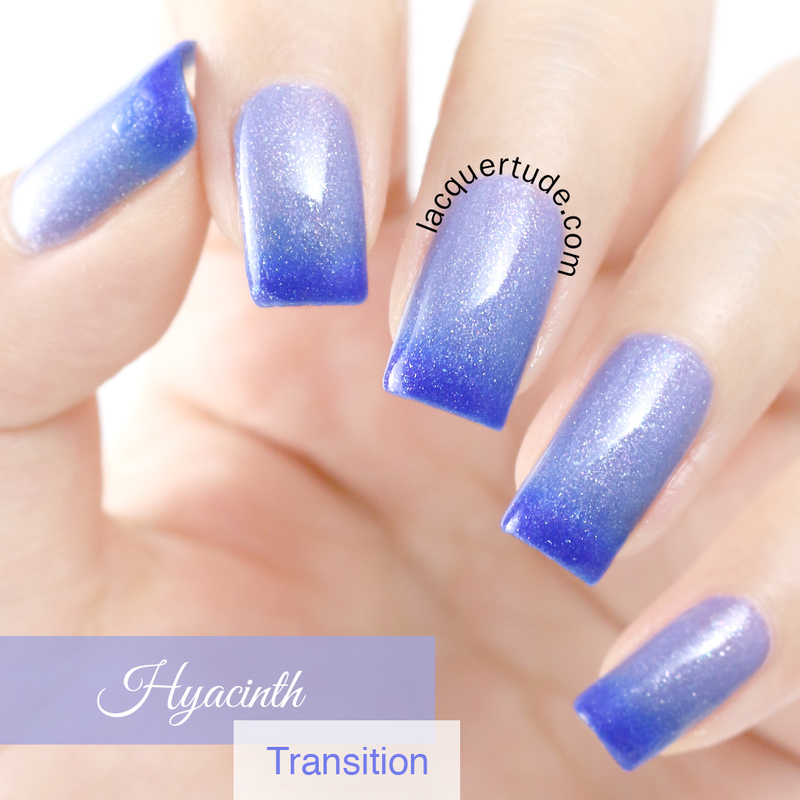 This is hands down my favorite transition color combination that I’ve seen to date. When cold, nearly the entire nail is purple. You can see the depth of the flakes really well in this darker shade. 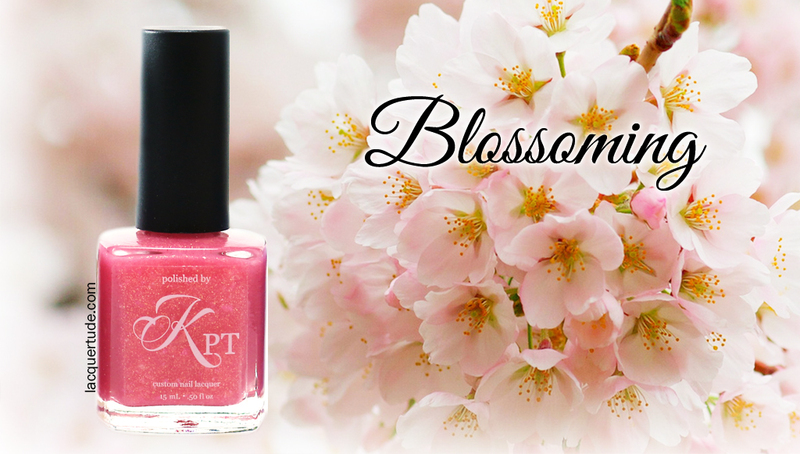 Blossoming is inspired by the cherry blossoms that makes me so happy throughout April and May each year. This one is another favorite of mine, tied with Love In Bloom. 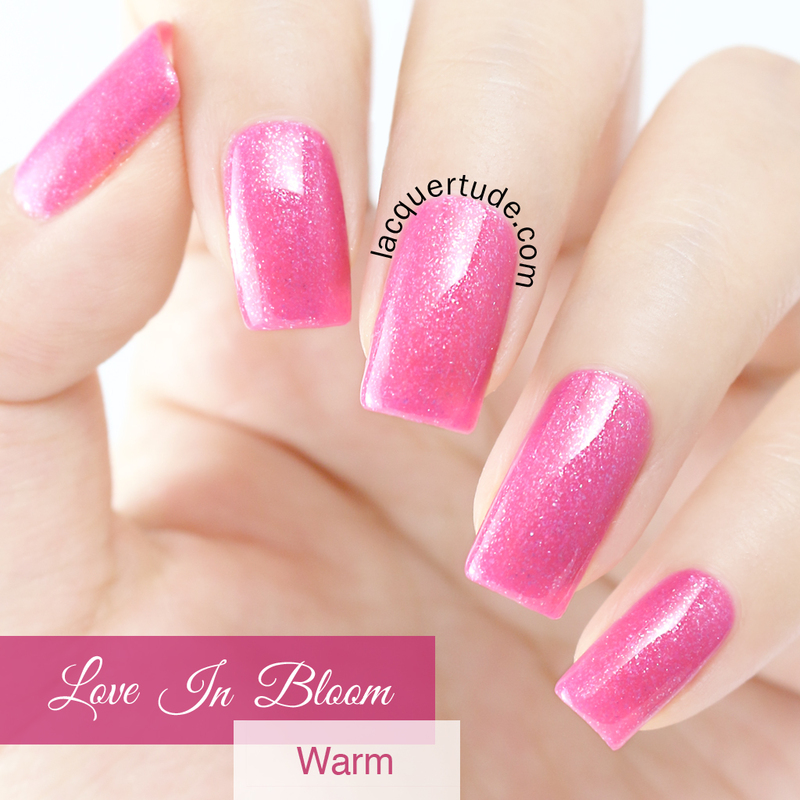 When warm, this thermal is a soft pink base filled with gold shimmers, pink and purple flakes and iridescent glitters. During transition, the pink deepens slightly and you can see a vibrant pink/coral red tip. The cold shows off the pink/coral side of the thermal. It’s so bright yet delicate at the same time. It also looks really juicy to me, almost as if I can squeeze out some cherry nectar from the tips of each nail! LOVE! 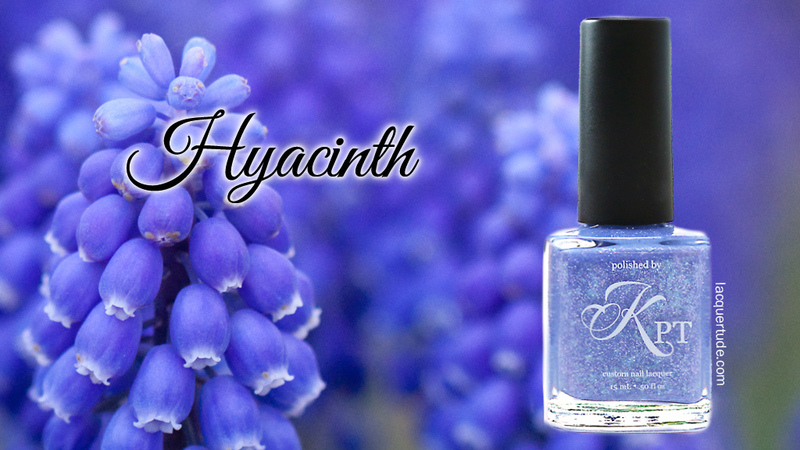 Hyacinth is inspired by the vibrant blue and purple color of the hyacinth flower. When warm, it’s a dainty amethyst color. During transition, the tip shows the bold blue. When cold, the sapphire blue really shines. This photograph shows how wet my fingers were when I took the shot. I didn’t have time to dry them because I wanted to capture the blue in its brightest and most saturated moment. I actually quite like the wet look—it’s like as if we’re looking a sapphire gems under clear waters. 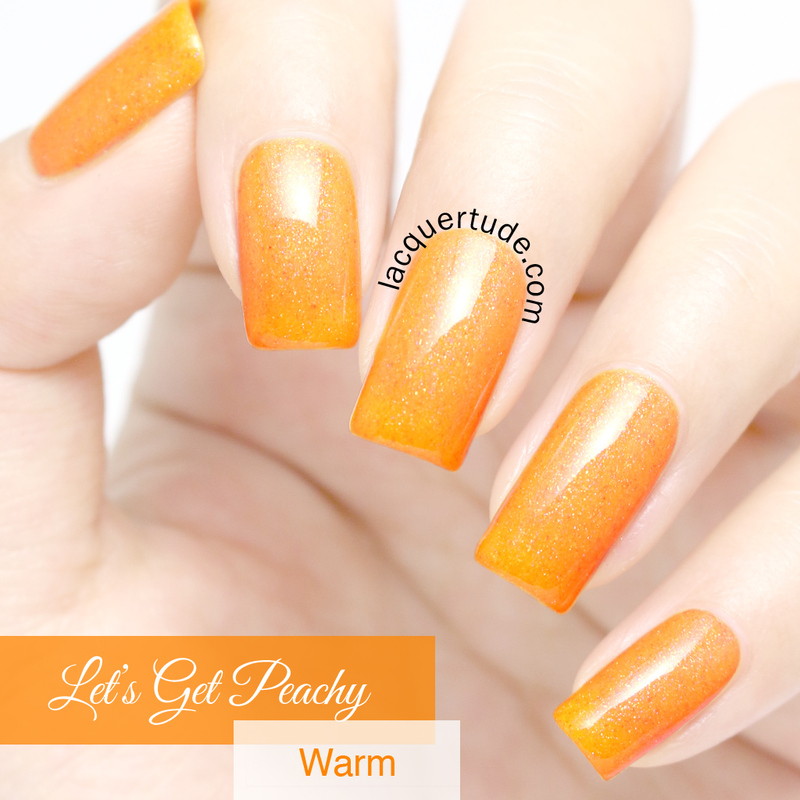 Let’s Get Peachy is a vibrant and fun thermal inspired by the peach fruit and the sunshine! When warm, it’s a shimmery peachy orange. 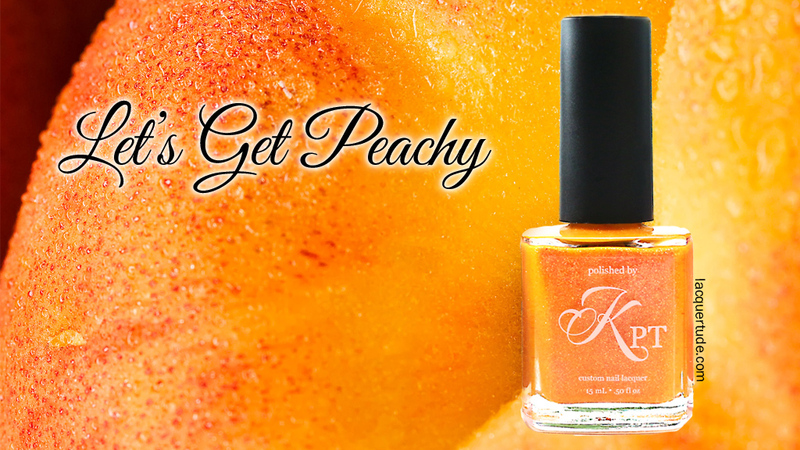 Just look at the cute red sparkles in there, really makes the polish look like the texture of the peach fruit. 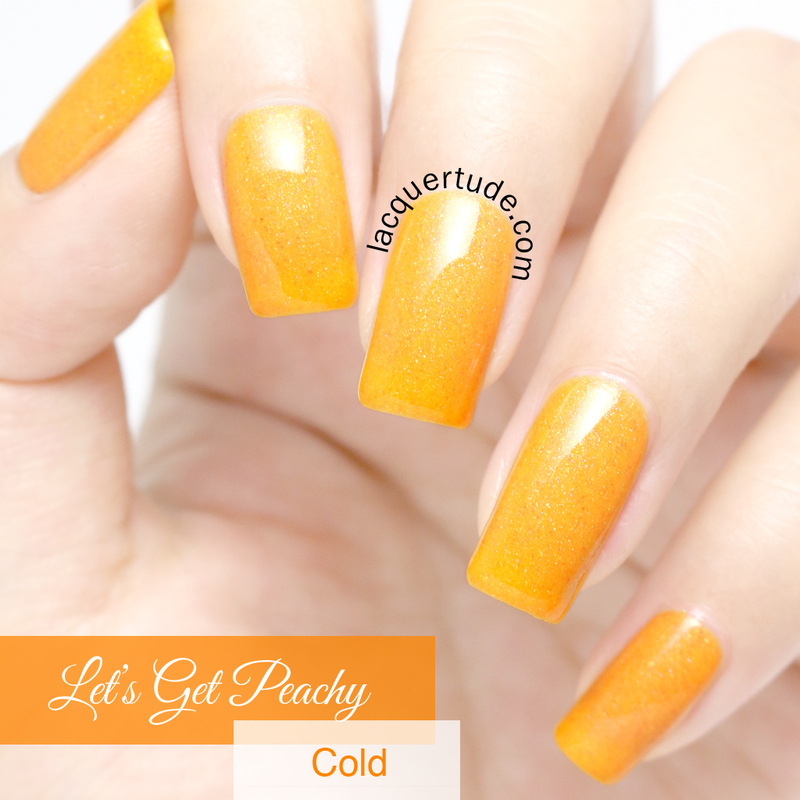 And peaches happen to be one of my favorite fruits, so this is one YUMMY thermal! During transition, you can see the more yellow/orange tips. This one was really hard to capture during transition since the effect is more subtle compared to the other shades in this collection. But, it’s still really pretty. When cold, you can see the bright yellowish orange color. 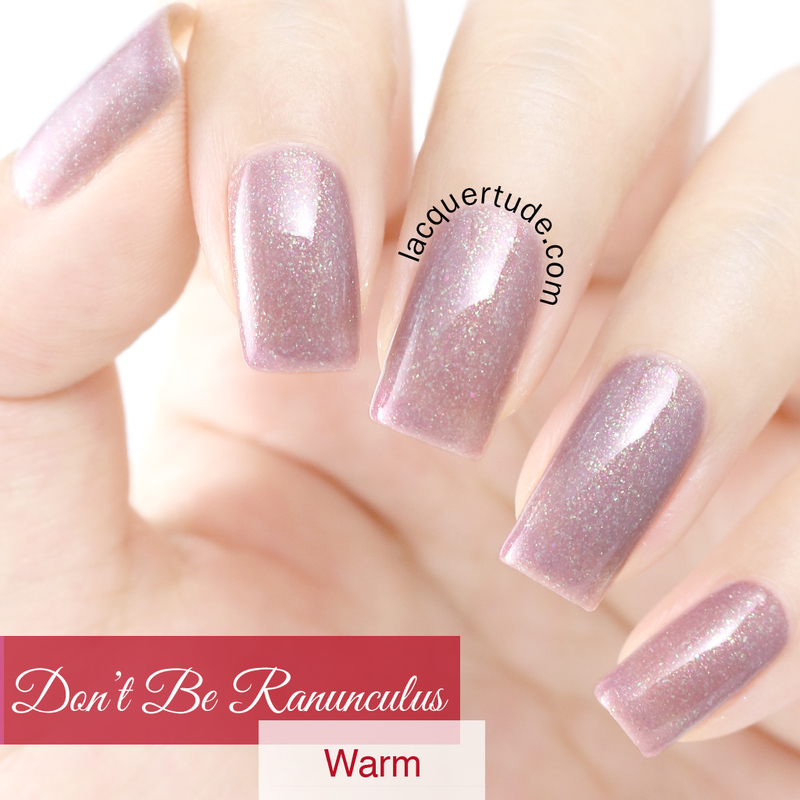 Don’t Be Ranunculus is inspired by the ranunculus flower colors. When warm, it’s a pale mauve color filled with green micro flakes, pink & red shimmers. I have to say that this shade truly shows off the various colors of the flakes best. They’re practically glistening within and throughout the polish! During transition, you can see the beautiful red tips. When cold, this thermal really wowed me with the intense cranberry red hue. To photograph the thermal transitions, I first shot my hand in normal room temperature, which shows the polish in the warm state. For me, the warm colors are how I see them most of the time. For the cold state, I dipped my fingers in ice cold water, took it out immediately (as these colors transition really quickly, which means they also return to the warm colors fairly quickly) to snap the shot. Finally, I waited for a second or so until there’s a nice french tip to shoot the transition state. The entire collection sold out quickly when they launched. Thankfully, they’ve been restocked, but I would not hesitate to grab your favorites as I’m sure they’d sell out again soon! 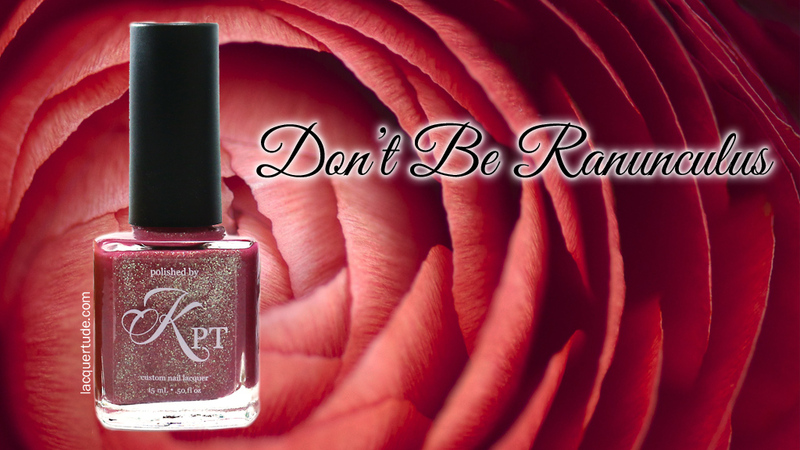 So, run, do not walk and get your spring thermals on from Polished by KPT! Wow the whole collection is gorgeous! I want them all! lol and beautiful swatches as well! Absolutely gorgeous swatches Kate! I have the last two already, but you’ve just convinced me that I need the others as well!